I'm jumping on Sarah's bandwagon and sharing my stash. I love it. I love that it's the first thing I see as I walk up the stairs. I love that I can look at it and see so much potential. I really just like looking at it, period. ~ I buy a lot of one or two-color "basic" prints, that can be mixed with anything and everything. That is basically how Sunshine Daydream came about. That was a stash-only quilt, and I'm very proud of that! ~ I used to buy mostly fat quarters, but as I've grown as a quilter and can better evaluate a print's versatility, now I mostly buy half yards. There are also some that I buy yardage of because I know it's something I love that I can use often. I still buy fat quarters of prints that are niche-y, or that I'm not sure I'll use more than once or twice. That's very occasional. Most of my fat quarter stash come from leftover halves. 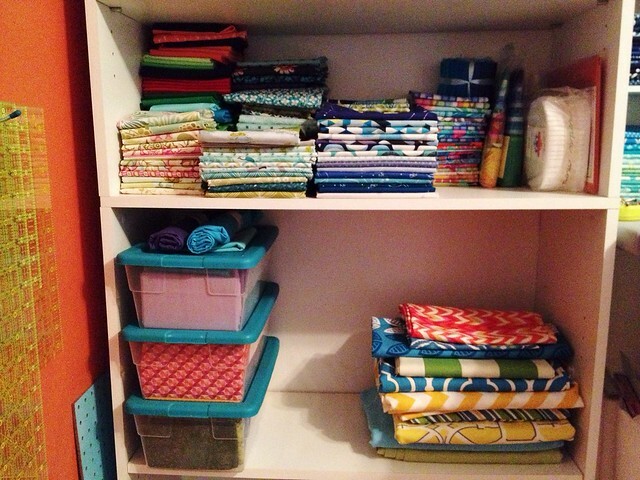 I used to organize my 1-yard and up fabric on mini-bolts, but I discovered that I could fit a whole lot more on my shelf with just plain old-fashioned folding. I do use uniform folding techniques to make everything fit together and look neat. I don't like messes. I'm a nerd like that. 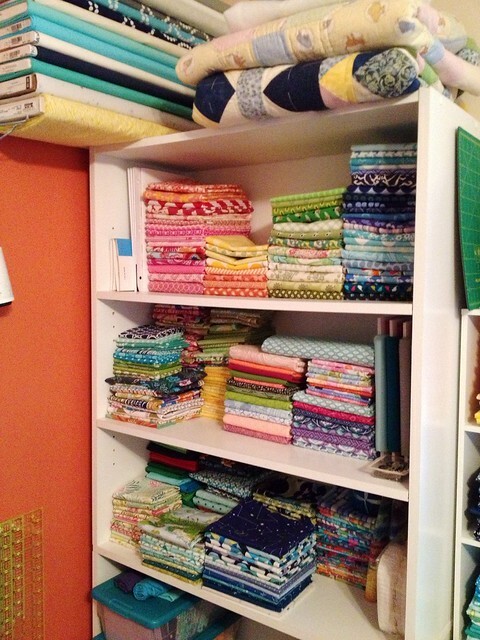 On top of the shelf are bolts of fabric that are ~3+ yards, as well as some of my older quilts. And I think some batting leftovers. The top shelf holds cuts that are about 1-2 yards. I need to beef up my yellows, they've been looking kind of sad since I finished Sunshine Daydream. Yellow is harder to come by than one would think! I also have my color cards up there for quick reference. 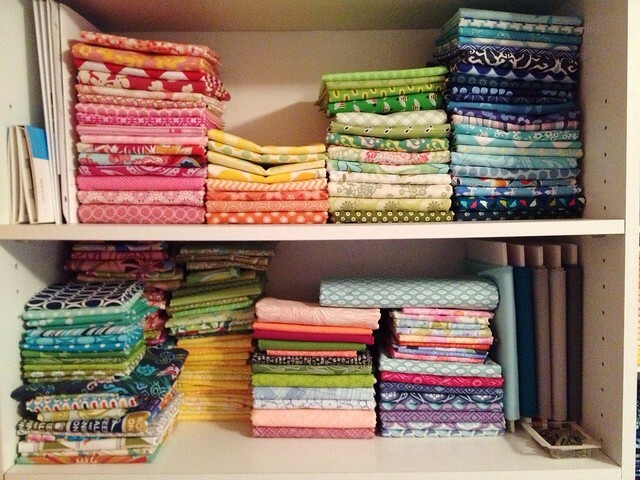 The second shelf has some fat quarters, as well as some collections that I have yardage of. There is also the backing fabric for Honey Honey waiting to be pieced as well. The third shelf has more collections, as well as pulls for future projects, precuts, and some of the solids. The next has bins that are holding pulls for current projects, like the BOMs I'm in this year. 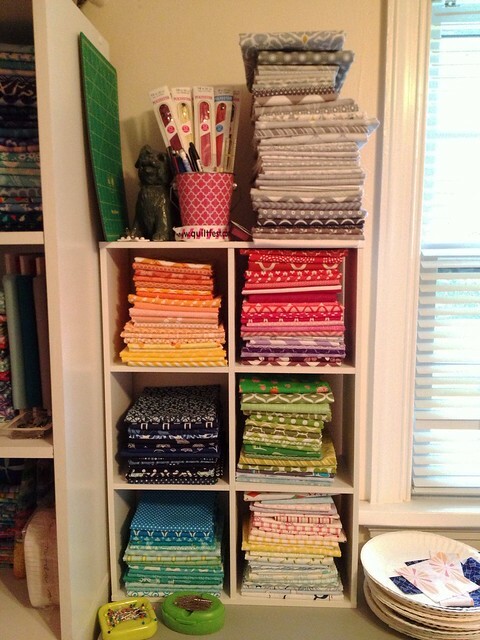 There is also a stack of home dec fabrics there as well. This little shelf holds the bulk of my blenders and whatnot, organized by color. There are also some low volumes there at the bottom, and my faves, gray, at the top. So that's it, for the most part! I have a bunch more in the cabinet on the other side of the studio, but those are mostly bits and pieces left over from early in my quilting days, before I got more of a handle on my 'style'. Now those are practice bits and whatnot. So how does your stash look? Are there gaping holes, like my yellows? Ahhh... Thanks so much for sharing your beautiful stash. I especially appreciated hearing your thoughts on how much to buy. I'm working through that right now. Thanks for jumping on my bandwagon! A fabric bandwagon!! what an awe inspiring stash! love looking at how neat and uniform it is. My stash definitely has holes. I'm low on reds oranges and yellows! 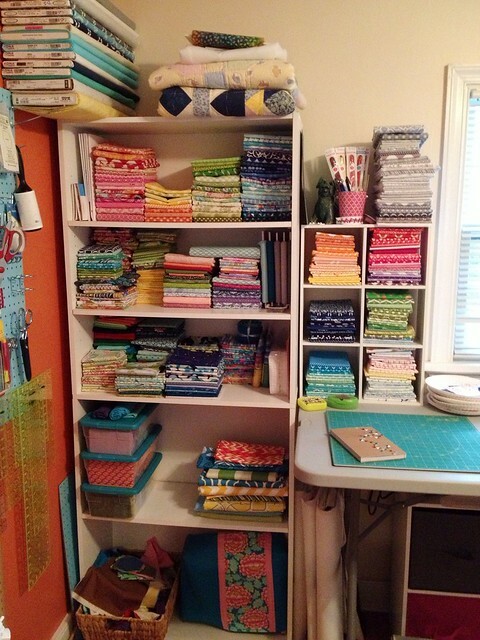 I tend to buy with specific quilts in mind and I haven't made any with those colors recently! Very pretty, I am still getting my style on right now. I usually just buy for the project. Once that's done. Yellow is hard to come by. Beautiful stash! I confess, I'm still buying collection FQ bundles, even though I find I hate to sew quilts with them. I know. I have problems. I am doing better at pulling prints out and mixing them in with other stuff, and I am doing better about buying collections that have what look like "useful" prints mixed in with the "showcase" prints (Waterfront Park, for example).